The design trajectory of PAROis shown below. 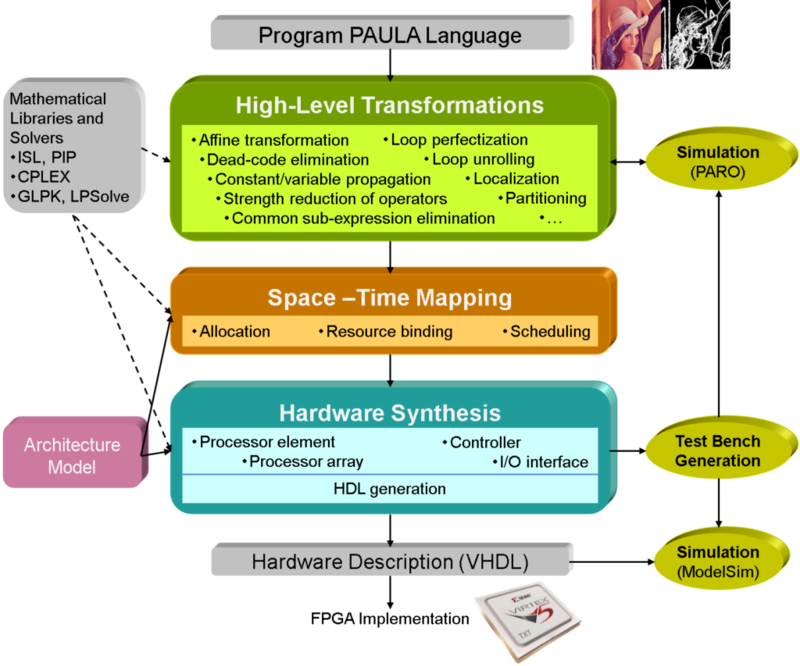 Starting from an algorithm description, a sequence of high level source to source transformations, scheduling, and RTL generation is applied to obtain a hardware accelerator in form of processor array. For design entry, a new language (PAULA) for dataflow-based algorithm description as communicating nested loops is used. The language can be used both for behavioral description as well as architecture description. New multilevel partitioning technologies for balancing memory hierarchies and communication requirements. Several other advanced transformations like localization and standard compiler optimizations like common subexpression elimination, and others are also available in the high level transformation toolbox for obtaining amenable algorithm descriptions in terms of data reuse and resource usage. 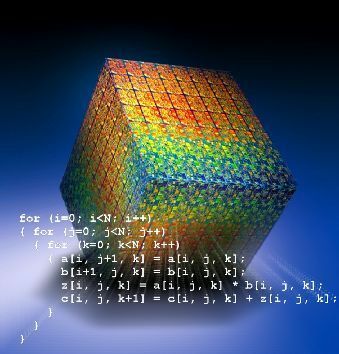 Scheduling based on Mixed Integer Linear Programming (MILP) with modeling possibilities of resource constraints, speculative execution, software and functional pipelining. Functional simulation and Modelsim simulation at different levels of design flow for validation. The PARO backend produces an intermediate RTL representation which is retargeted to VHDL. Also an automatic testbench generation is included. The PAULA languages enables a compact and intuitive representation (big operators/reductions like SUM, PROD, MIN, MAX) of a given algorithm. Optimal hardware generation in terms of performance leveraging the available parallelism in the algorithm with respect to resource constraints. Automatic generation of an I/O interface for the hardware accelerator for integration in System-on-Chip on an FPGA. State-of-the-art medical imaging applications from industry have been successfully synthesized with PARO.